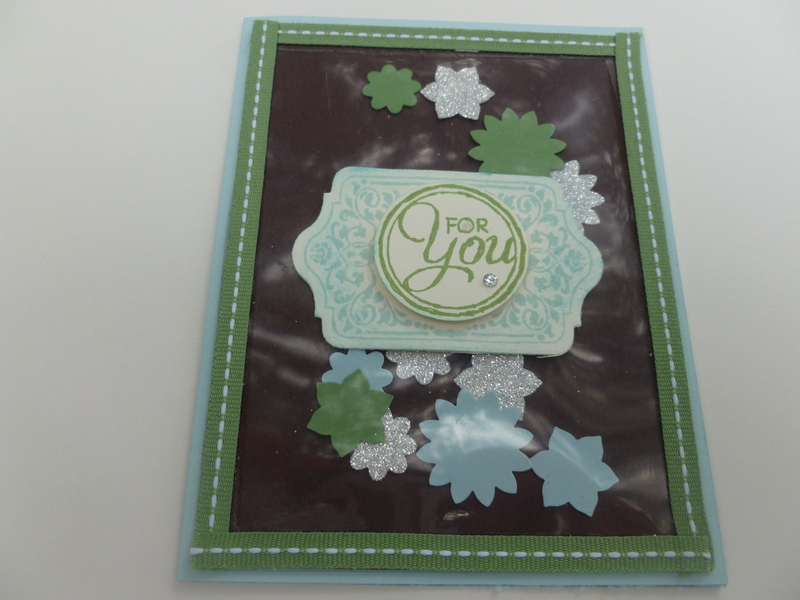 Today’s card was made from inspiration using the Blooms and Butterflies color challenge and watching the 2013 Stampin’ Up! Convention. Watching the opening ceremony for the convention they demonstrated a shaker card using the Washi Tape, which happens to be on my wish list. So I decided to switch it up and use what I do have. This card is super fun to put together. When you pick it up and shake it the parts move inside, Fun! 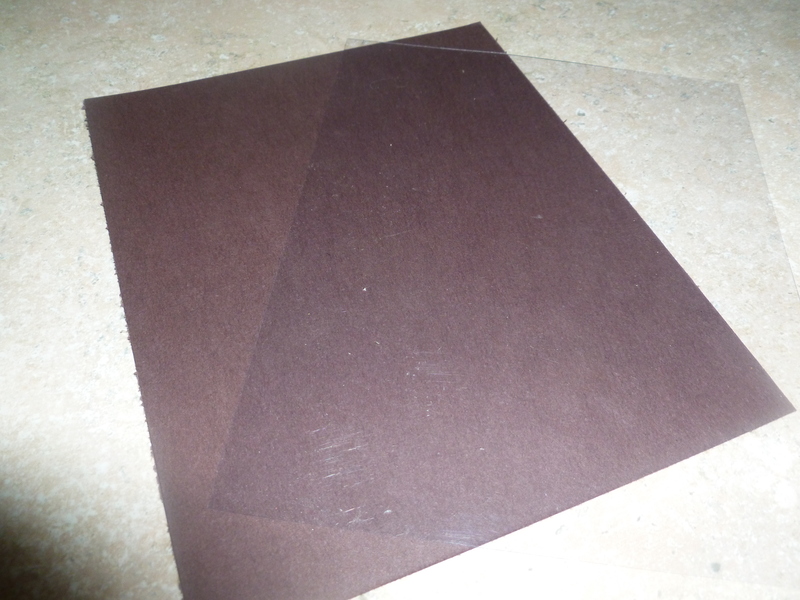 Card size: 5 1/2″ x 4 1/2″ : Layers: Chocolate Chip and Window Sheet are both cut out at 5″ x 4″ Other parts: Punched out & I used the Chalk Talk Framelits (you could cut out with scissors if you don’t have). Step 2: Punch out your items you want inside to shake,(you could use an array of items inside). Add the pieces inside. 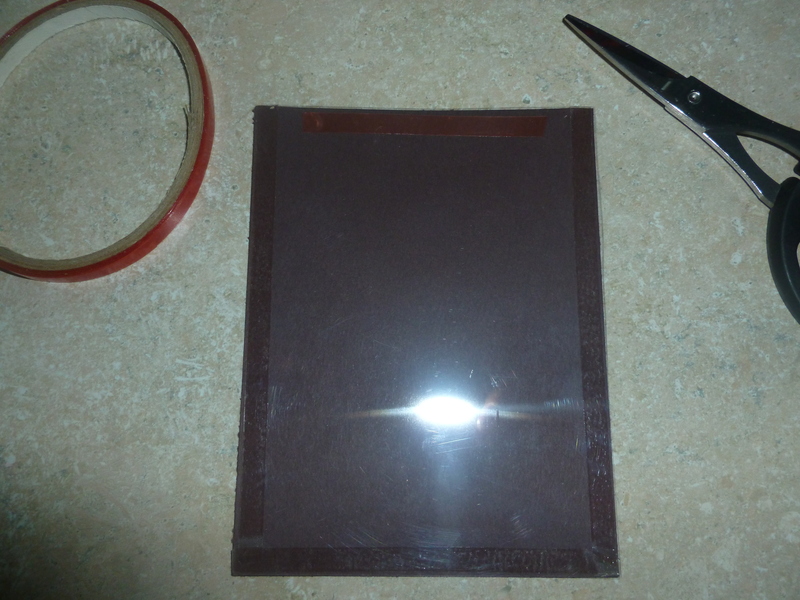 Step 3: Remove the film cover off the sticky tape on the 4th side to seal. Step 4: Use sticky tape or snail on the outside of the window sheet on all 4 sides and cover with ribbon. 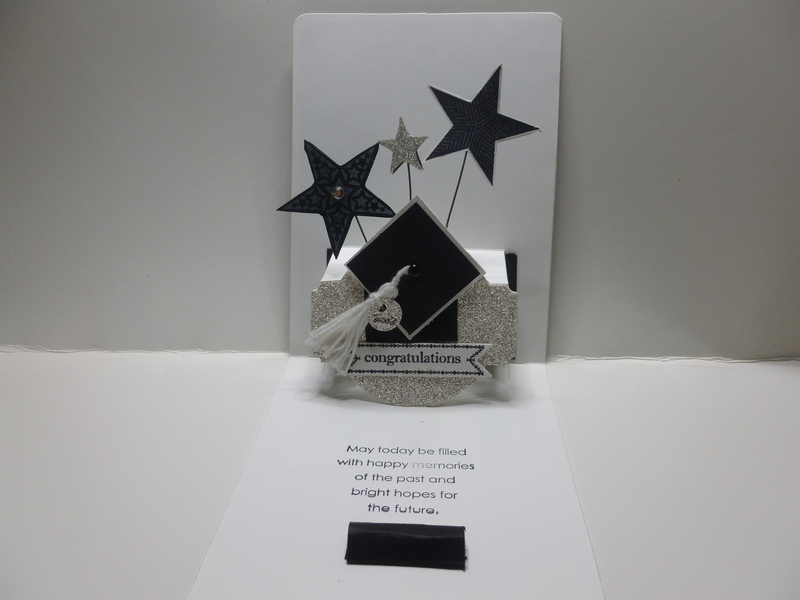 Step 5: Finish by attaching the layer, sentiments, images and any embellishments and attach to base card. Note: If you do have washi tape then it’s even easier. 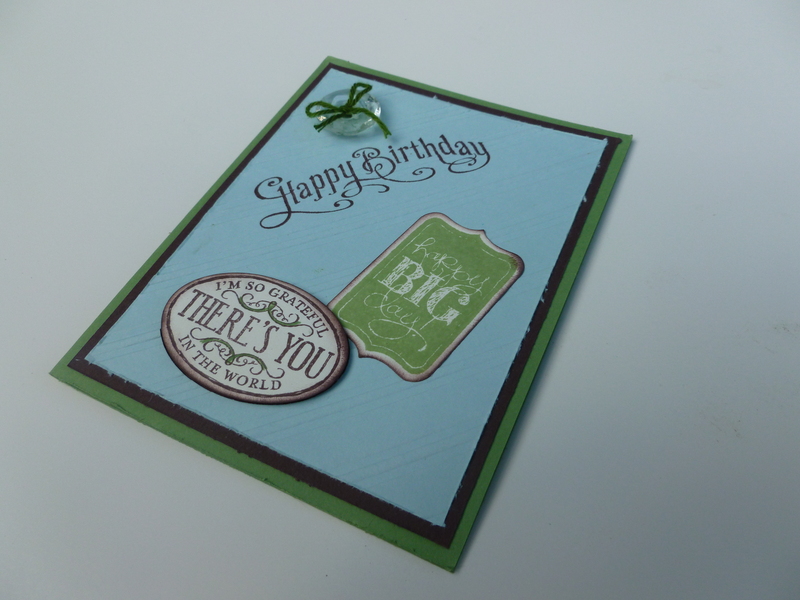 Start with colored cardstock and lay the window sheet on top. Apply washi tape on all 3 sides. 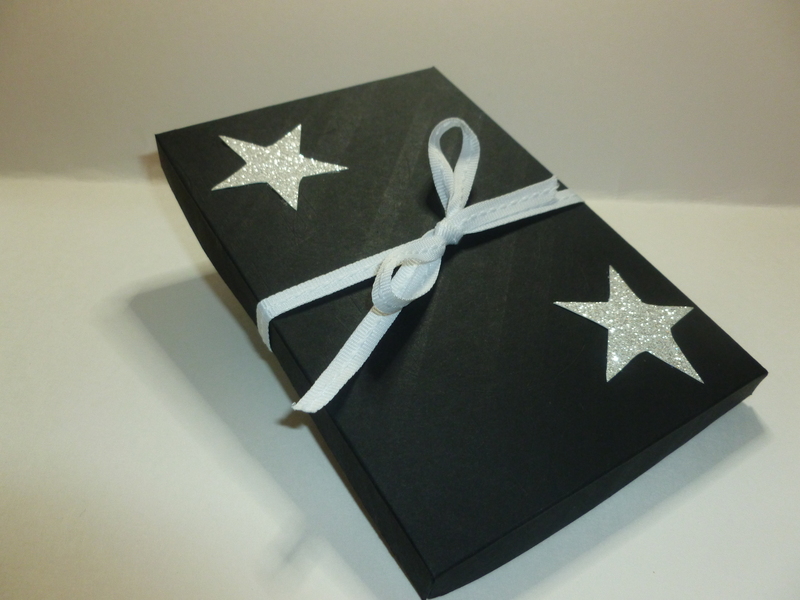 (You want to get some washi tape on the front of the card and some on the back side so that this forms the seal). Punch out your goodies and add inside. Close the 4th side with the washi tape. 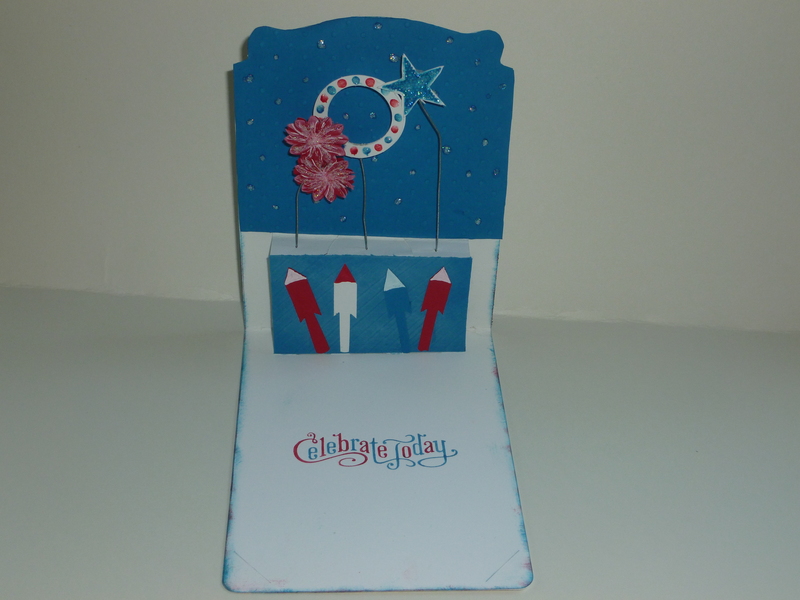 Finish your card by attaching any sentiments, images and embellishments you like and attach to base card. Thanks for stopping by today and I hope you have a wonderful day! 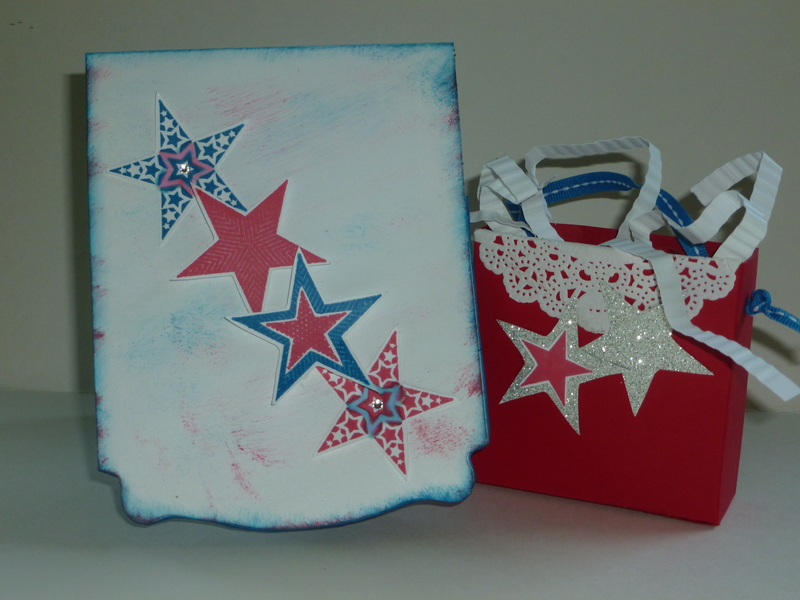 Paper Pumpkin by Stampin’ Up! is a new monthly kit program that anyone can enjoy! 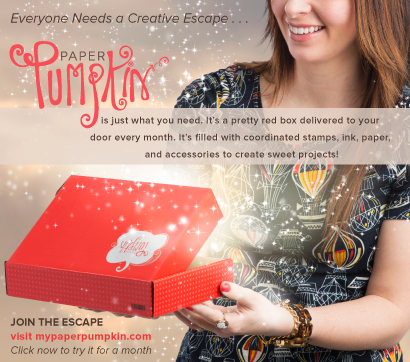 A Paper Pumpkin membership is $19.95 per month (and shipping is included!) There’s no commitment, you can cancel your monthly Paper Pumpkin at anytime. You can also skip a month if you want. Simply sign up for the program now by clicking here . Please be sure to choose me as your demonstrator during the ordering process by selecting 2122453. Every month a new, surprise project kit arrives at your doorstep. Just think of the anticipation of creating a fun project to pin, showoff, and share with your friends and family-every month! Once you have completed your sign up please email me at dawnscreations2@gmail.com so that I can send you your personal video showing you how to assemble your creation. Club members can also email me a picture of their creations that they switched up. I would love to post and share your creations on my blog (with your permission )! In addition to the video, as part of becoming my club member I will be doing a random drawing based on individuals who participate in that months club for a special gift from me. I am super excited and look forward to the next Paper Pumpkin aren’t you? Whoot Whoot goes the owl…. 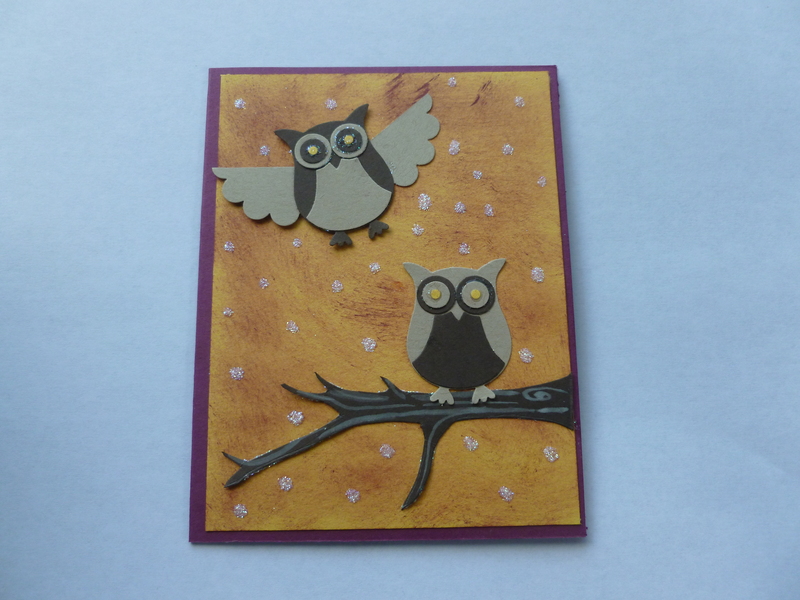 Today’s card was made by the inspiration of our little owl friend who lives in our backyard. We can never seem to spot him but he let’s us know here’s around by hearing him. 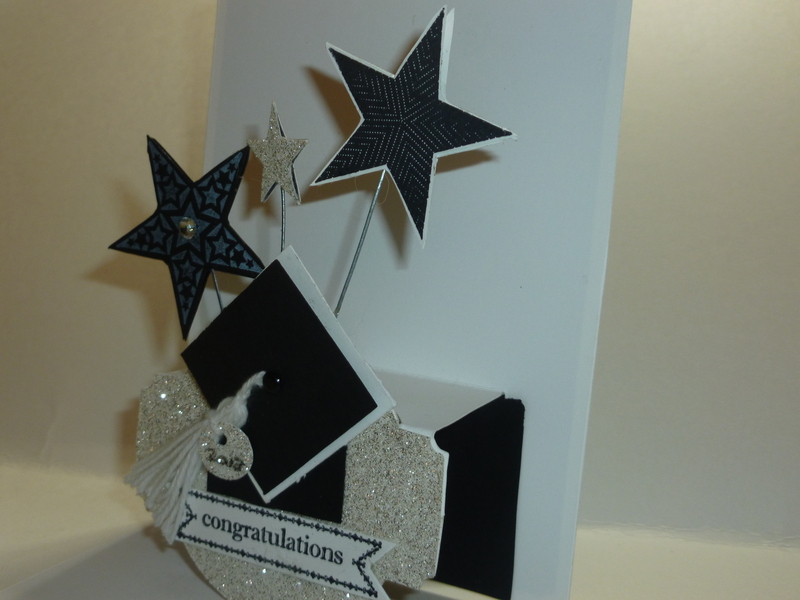 Here is a Graduation card that I made yesterday for my dear friend who’s son graduated. I hope that this may bring inspiration to you. The round black roll at the bottom of the sentiment is a place to slip in some money. It looks like a little diploma when you have it in there. You could change the colors around for your school colors. 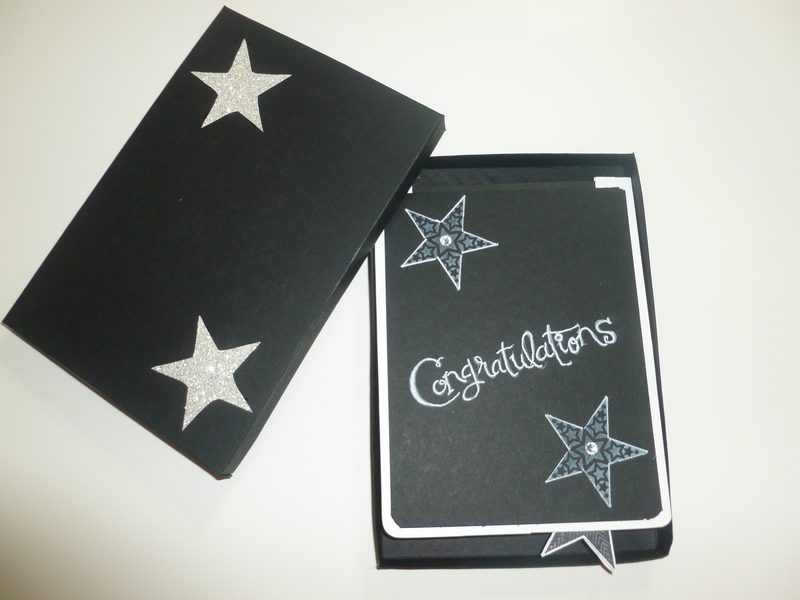 Or even if you didn’t have the stars stamp set wouldn’t it be cute with mini “caps” poking out. I really like cards that move or pop out don’t you? I think it adds to the fun! If you would like to see a video of how this card was made drop me a comment. Stamp Set: Itty Bitty Banners #132022(w) or #126257(c), Simply Stars #130889(w)or #130892(c), Sassy Salutations #132070(w) or #126707(c) as a note the Sassy Salutations is at 25% off right now which ends June 30,2013. 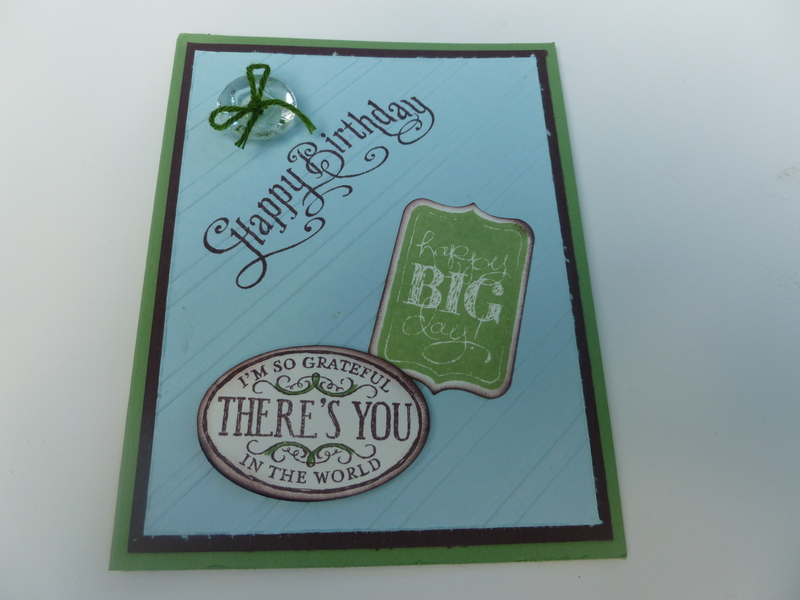 Misc: Stampin’ Pierce Mat #126199, Simply Scored Scoring Tool #122334 (to make the box), Bone Folder #102300, hot glue gun and glue sticks and twist ties or any flexible thin wire and any sentiment you would like. I would love to earn your business whether it’s answering any questions you might have, shopping with me or taking my virtual class with paper pumpkin. Thanks for stopping by with me today, come back again tomorrow to see what I’m up to and I hope you have a wonderful day!